Blank IATA & IMO declaration forms are designed for computer generated DG declarations. Achieve the required coloured borders - and save money in the process - by printing onto these forms with your office laser/inkjet printers. IATA and IMO declaration blank forms are designed to work with any number of shipper's declaration software. Form templates and software allow for storage of data, saving time and reducing mistakes on repeat shipments. Ask about receiving an IATA or IMO declaration template for FREE, when you purchase packages of blank forms. Full shipper's declarations for dangerous goods and IMO DG declarations are also available for those who prefer to complete by hand. Do you frequently ship from the same location, to the same location, the same kind of dangerous goods? Ask us about our customized pre-printed options. 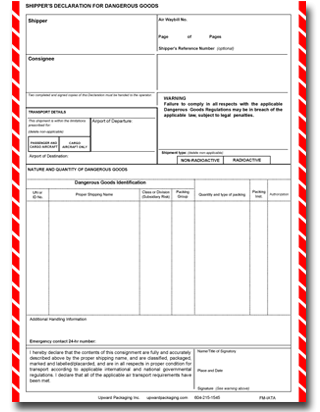 Description Blank forms for AIR shipments, with IATA striped red border. 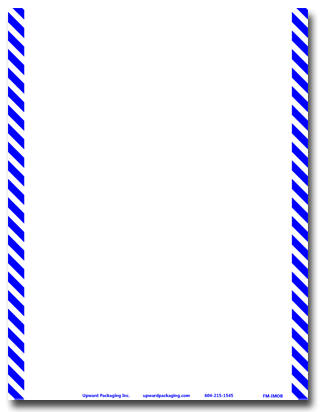 Description Blank forms for MARINE shipments, with IMO striped blue border. Description IATA Shipper's Declaration forms with IATA striped red border. 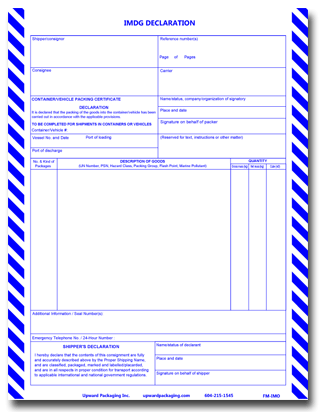 Description IMO Shipper's Declaration forms for marine transportation of dangerous goods.